Armageddon 2001 was DCs event of Summer 1991. A massive cross over tale, the story began in its self titled 1st issue special and spun off into 12 annuals of the most popular comic titles of the day, before concluding in a second special. 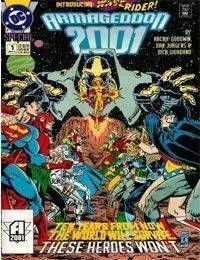 Written by Archie Goodwin and Denny O Neil, and drawn by artist Dan Jurgens, Armageddon 2001 chronicled the birth of time-travelling hero Waverider. Hailing from a dystopian possible future in the year 2030, where a super hero had been corrupted and reborn as the dark overlord known as the Monarch.<br />Matthew Rider volunteered for an experiment that gave him the ability to move through time. Now calling himself Waverider, Matthew traveled back to the present to try to stop Monarch before his creation. By making contact with any given super hero, Matthew experienced a version of that heros future, and he became closer to deducing Monarchs identity. As he moved through the summers annuals, Waverider saw varied alternate futures. In one timeline, the Joker died while fighting Batman, electrocuting himself by stabbing his metal cane into a socket. In another, Superman was corrupted by his own power and was killed by Batman wearing his kryptonite ring. In yet another, the Martian Manhunter retreated to life high on a mountain top, dispensing his wisdom to passers by.<br />But just as Waverider finished a trip into Captain Atoms possible future, his mission was interrupted as Monarch ventured back to the present to destroy him. The heroes united against the dictator, and Monarch was revealed as former hero Hawk. Corrupted by the death of his partner Dove, Hawk was driven to insanity and adopted the identity of Monarch, only to be defeated and sent reeling back through the time stream by the power of Captain Atom.